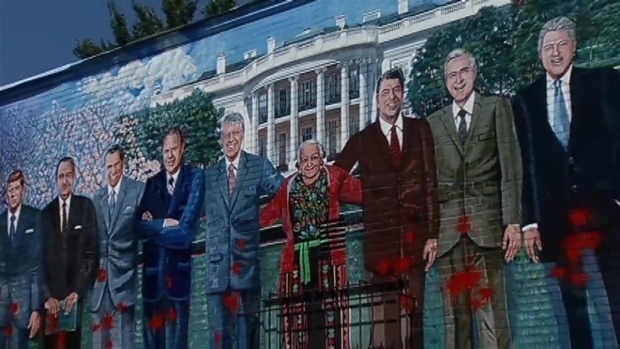 The manager says the damage is "personal"
The famous mural of 11 U.S. presidents on the side of a Middle Eastern restaurant in Northwest D.C. was vandalized early Wednesday by someone who fired paint pellets at the crotch of each leader. Mama Ayesha's Manager Amir Abu-El-Hawa, arrived to work Wednesday and found red stains on the bodies of each president painted on the side of the 1967 Calvert St. NW restaurant. "It's sad. My family has worked hard for this restaurant -- blood, sweat and tears over the past 55 years," he said. Award-winning artist Karlisima Rodas created the mural over the course of three years. Mama Ayesha's manager says someone shot paint balls at the mural at his restaurant. "I'm just so devastated," she said. "I was on the scaffold for three years." Rodas said it cost $25,000 to fund the project. She finished it a few years ago. DC covered half the cost with grant money and Mama Ayesha's paid the other half. "We worked hard. This mural is not just for us. It's for the city," Abu-El-Hawa said. "Why would you want to ruin something that's so nice?" The mural was created to honor the restaurant's founder, Mama Ayesha Abraham. It features each of the presidents since President Dwight D. Eisenhower. Paint was splattered on each president, but the image of Mama Ayesha at the center was left untouched. 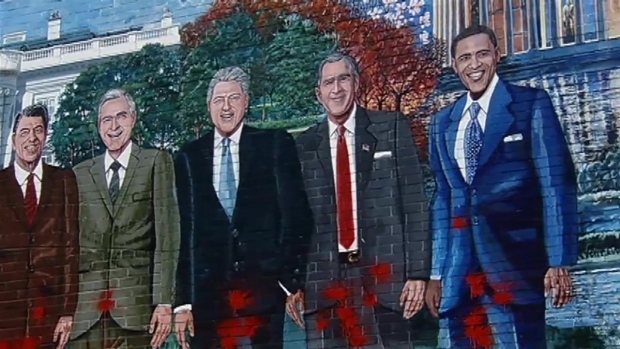 The mural has been damaged by graffiti before, but never to this extent, Abu-El-Hawa said. An attempt to scrub off the paint smeared the mural. He said he hopes surveillance video of the area will help investigators find the vandal. The restaurant manager of Mama Ayesha's talks about the mural that was vandalized. The restaurant is now fundraising to meet a $6,000 goal to clean the mural without damaging it.